Based in Melbourne, Australia, Justin received an AFI/AACTA Award nomination for best short film for his drama ADAM’S TALLIT. The film enjoyed an extensive life on the festival circuit in Australia and overseas, winning many accolades along the way. Justin conceived and co-directed the feature documentary CURTAIN CALL with Waterbyrd Films. Focussing on the Australian pioneers of children’s pantomime theatre as they face a cruel eviction from their beloved theatre, the film premiered at the Melbourne International Film Festival to critical acclaim and was broadcast on SBS. He received a grant from the Ian Potter Cultural Trust to travel to New York for a screenwriting intensive with NYU’s Marilyn Horowitz. Justin was selected for the Screen Australia/Open Channel funded ‘Raw Nerve’ program, directing the short film FUN CITY – which premiered at the 66th Locarno Film Festival and was nominated for the best short film ATOM Award. He was selected for Berlinale Talents, taking part in master classes, talks and events with emerging filmmakers from all over the world. He completed director’s attachments on the Australian feature film STRANGERLAND and the ABC comedy mini-series STORIES I WANT TO TELL YOU IN PERSON. He’s also been a short film judge and selector for the AACTA Awards, ATOM Awards and Flickerfest. 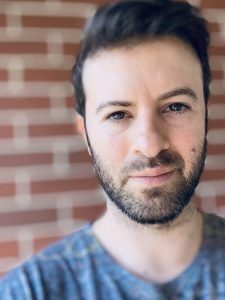 He co-created and directed the comedy web series ECHO CHAMBER with Carla Silbert, and his short film THE VISITOR won the best director award at the Sao Paulo Film Festival and best short screenplay at the New York Screenplay Contest. The film received production funding from the Besen Foundation and the City of Port Phillip’s Cultural Development Fund. His feature film SHOSHANNA is in development, recently obtaining draft funding from Creative Victoria. He is a graduate of the VCA School of Film and Television.